Naming each pizza I create is fun. A number of names were in the running for this one. Andrew thought “Burn Your Lips Off Pizza” was the most descriptive. By the time I ate the second slice I had a runny nose, so I thought “The Decongestant” would be appropriate. I went with the most literal name because this pizza is simply a hot pepper pizza. 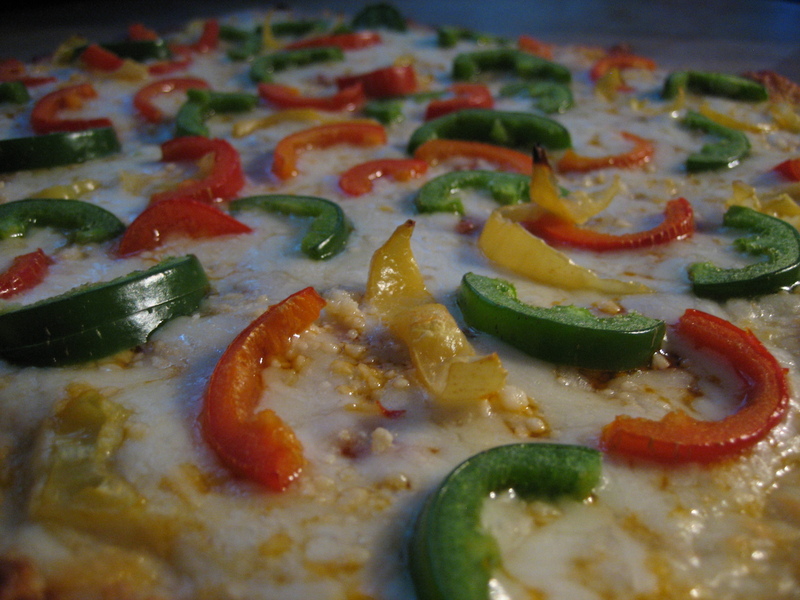 I used my homemade pizza sauce, mozzarella cheese, and three types of hot peppers. The yellow pepper was so hot that I had to drink a glass of milk with this meal and Andrew even admitted that he probably shouldn’t of had a third slice. Despite burning our lips, we still enjoyed this pizza. This entry was posted in cheese, mozzarella, peppers, pizza, pizza sauce, sauce, veggie and tagged hot peppers, mozzarella cheese, pizza. Bookmark the permalink. Didn’t Andrew get a great photo?!?! ?